Considered Ireland’s only native breed, the Connemara Pony originates from an area of the same name located in Western Ireland and noted for its rocky, barren and mountainous terrain which is full of seemingly endless and desolate moors and bogs. Originally developed as a utilitarian working horse by the local farmers, the Connemara dutifully pulled a plow through the barren land, hauled rocks and other heavy loads over rough roadways and through heavy bogs, and carted the family to church on Sunday. Over the centuries in the ruggedness of their native environment, the Connemara developed its prized qualities of hardiness, agility, and steadfast disposition. The Connemara is recognized as the largest of the world’s pony breeds, ranging from 13 to 15 hands in height. Because of their deep, substantive, and sturdy body type, the Connemara make suitable mounts for children and adults alike, and compete very successfully right alongside more conventional sport horse breeds. While grey and dun are the most common colors for Connemaras, they can also be black, bay, brown, chestnut, palomino or even roan. Black points are common, but pinto coloring is not accepted. The rich heritage, as well as the temperament, intelligence and sensible nature of the Connemara, makes it an ideal candidate for work in harness in today’s show ring. Because of this, the Connemara is a frequent competitor in combined driving and driven dressage classes. The Connemara also possesses heart, determination, and extraordinary jumping ability, so it often competes as a show jumper, working hunter, or eventer. This versatile breed’s rectangular build makes the Connemara a natural fit for dressage, Western and English pleasure, and even endurance riding. 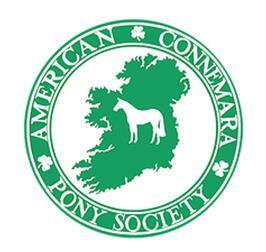 The objectives of the American Connemara Pony Society are to assist and promote the breeding, registration, training, exhibition, and general use of the Connemara; to preserve the unique qualities of the breed; to assist and promote equestrian competition; and to keep members informed of all matters concerning Connemaras.